Manufactured in Malaisie from 1987 until 0. This camera was presented at the SITI of 1987. Competition was then numerous between new cameras and cameras already present on the market, in the category of compact all weater, all terrain : Konica Jump, Chinon Splash GX, Chinon Splash AF, Fuji HD-R, Vivitar Trek 50, Canon AS-6 To explore, Fuji HD-M, Nikon L 35 AW AF. As a worthy camera to be catalogued “Seals”, competition is reduced to the Canon explorer and Fuji HD-M. 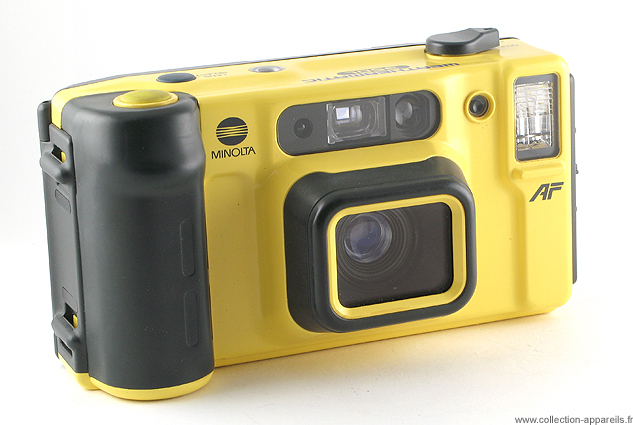 In shorts, Minolta seems to Be compromised interesting for the scuba diving.